I love that this room is now complete. I find myself walking through this space during the day just to look at everything! The change of paint makes the room feel so much more open and modern. Almost of our furniture we bought used and restored. The table and yellow chairs were Craigslist purchases that we repainted & reupholstered. The grey chairs came from Target and we changed the color of the legs from brown to white. Our buffet came from Chartreuse, an antique store in Frederick, MD, and our door came from an antique store in Leesburg, VA and we turned it into a shelving unit! 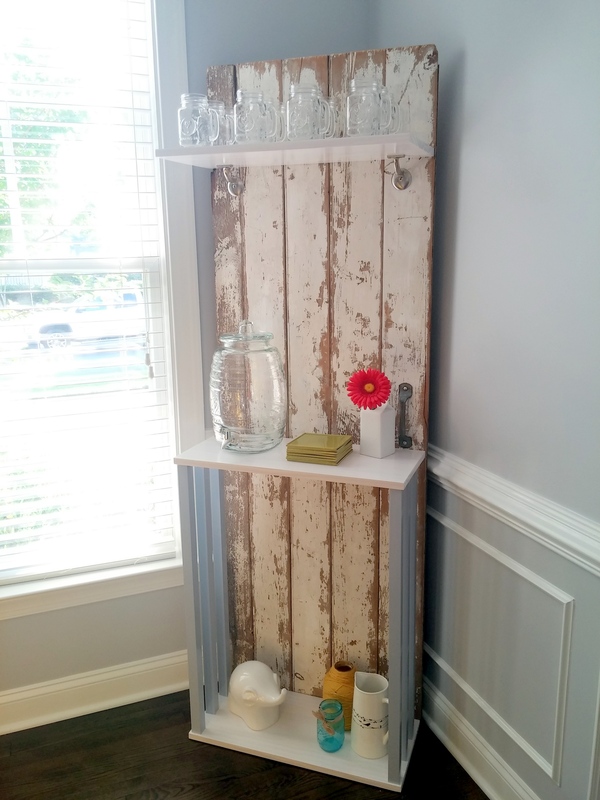 How to Make a Shelving Unit from an Old Door! This is by far one of my most favorite things in our house. We had been wanting to do this for a long time, but it took us a while to find the perfect door to use. We had looked around some of the antique shops down the street from our house, as well as Craigslist, but nothing was PERFECT. Either the size was wrong or we didn’t like the colors. Then, one day I’m at an antique store to buy Annie Sloan clear wax and I spied this door in the corner! I took the measurements, texted them to my husband, and BOOM it everything we wanted! I loaded that door into my Jeep and took it home ASAP. 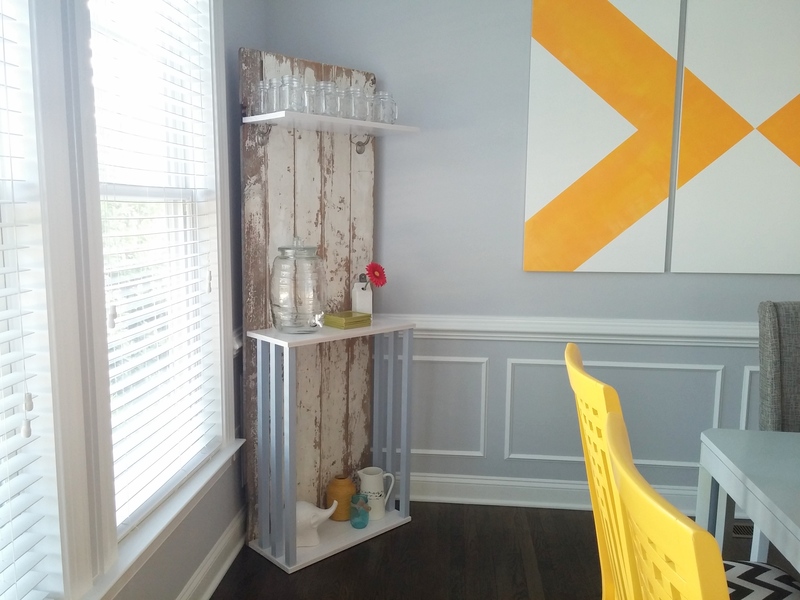 See how perfectly it fit into the corner of our dining room! This was a really fun project that turned out way to be way more time consuming than we originally planned for! We bought this buffet for a really awesome price at a local antique store that’s open once a month. If you’re ever in the Frederick area, you should definitely check it out! It’s called Chartreuse and you can click here for their FB page. Once we got it home and set it up in our dining room we decided to change some of the parts. The handles were really rusted, and my husband didn’t like their shape (he wanted some “manlier”), so we replaced them with these from Home Depot. The only issue was that even though our new handles were pretty large, you could see still some of the outline from the old handles, so we then decided to repaint the entire buffet. 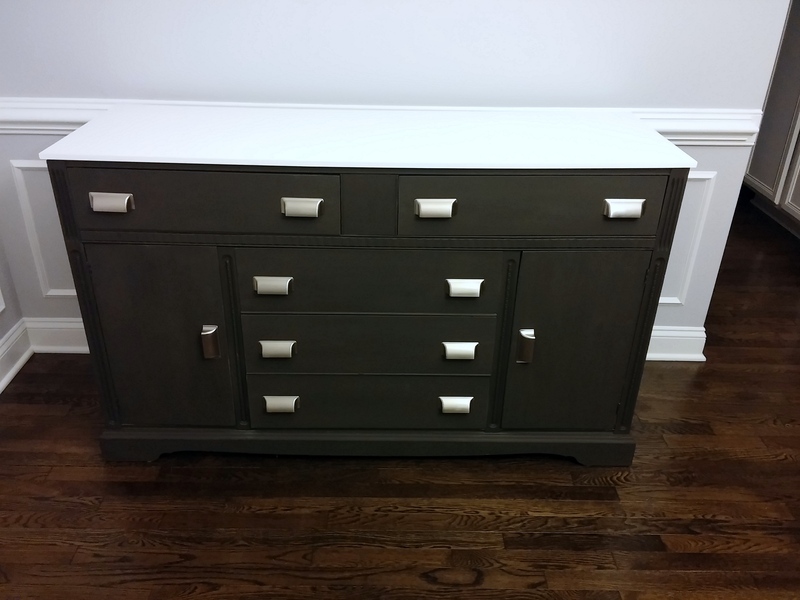 We wanted to use chalk paint, but we refused to pay a lot of money to buy the popular chalk paint you see in stores. So, we decided to try to make our own and it turned out perfect! Materials required: a bucket, Plaster of Paris, flat interior paint (in the color you desire), water, and something to mix it with. 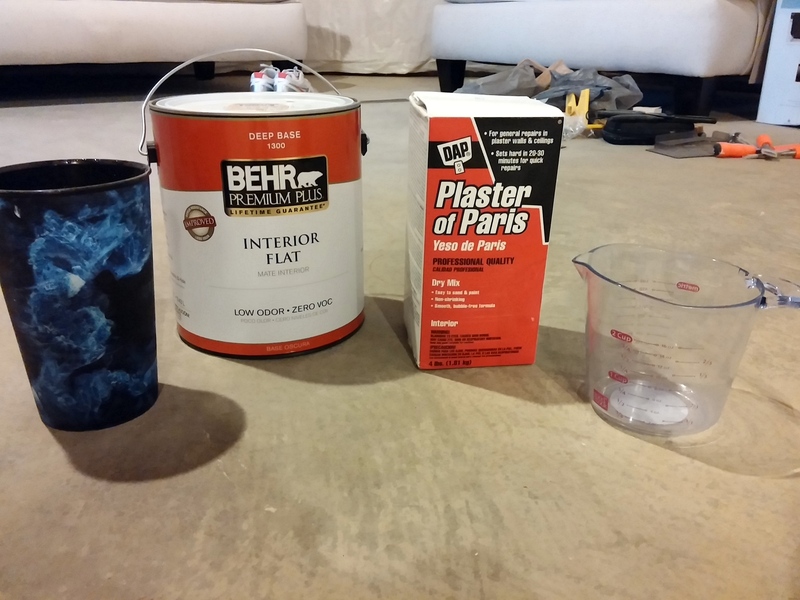 You’ll need 3 parts paint and 1 part Plaster of Paris (mixed with water) for your project. I recommend first mixing the amount of plaster of paris you’ll be using with water until it’s completely smooth. Once it’s smooth you can mix it with your flat paint (we used Stealth Jet by Behr). I used a small bucket I bought from Home Depot to mix everything together. When it’s completely mixed together you can go ahead and use it! I sealed mine overnight with a piece of plastic and a rubber band. I wouldn’t make too much at once, try to make enough for your project and a little extra for touch ups, but I’m not sure how long it will stay good! It looks pretty finished, right?? First of all, we are OBSESSED with this artwork that we made. 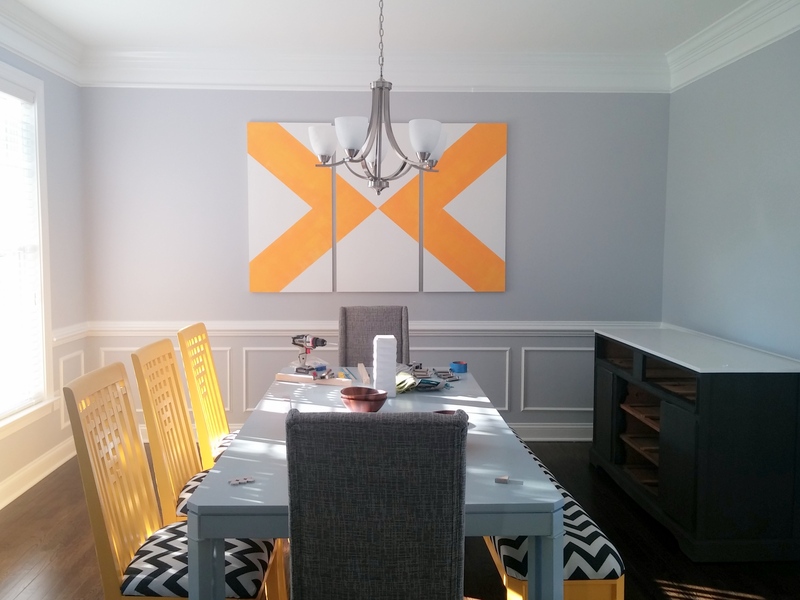 We saw some ideas on Pinterest that were similar to this, and we decided it was a great way to fill up the huge wall space in our dining room. It gave us another opportunity to give our wall space some color, and it let me show off some awesome stripe painting skills! Secondly, it was incredibly easy to make this. We started off with 3 pieces of MDF wood we bought from Home Depot. We decided to use MDF because it was light and was a lot cheaper than buying “real” wood. When we got it home my husband built a frame onto the back of each piece to hang them on the wall (otherwise we would have had to screw each piece into the wall from each corner, and we didn’t like how we envisioned that). Once the frames were glued into place (we used wood glue. That was a lot easier than nailing it or screwing it) we primed the pieces with latex stain blocking primer. Once that was dry we gave them a good coating of white semi-gloss paint that we had in our paint collection from previous projects. We spaced our canvasses out evenly by placing a piece of wood in between each piece. Now it was on to the most tedious part of this project: drawing the stripes onto the boards. My husband helped a lot with this project: he’s definitely way more into math and numbers than I am!